The Envision Virgin Racing squad heads into the third round of the 2018/19 Formula E season buoyed by its double podium finish in Marrakesh. 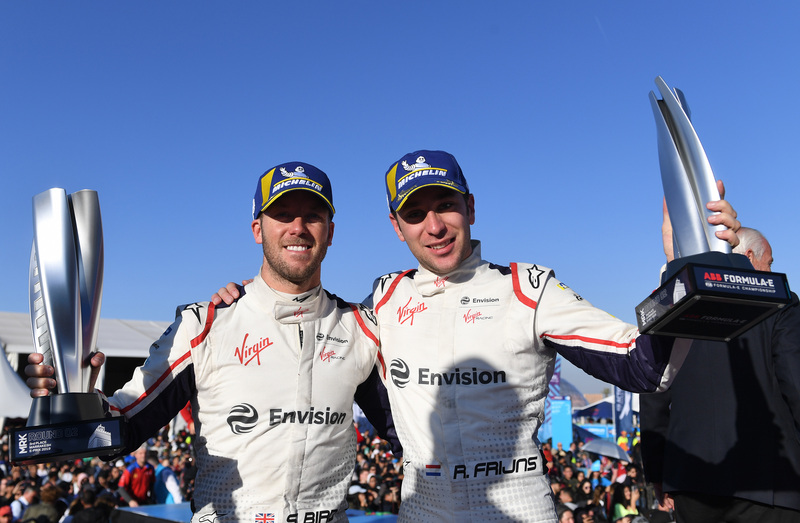 Claiming a double podium finish at the Marrakesh E-Prix acted as a “key turning point” in the 2018/19 FIA Formula E season for the Envision Virgin Racing squad. Virgin endured a difficult opening round of the campaign and failed to score any points at the inaugural race in Ad Diriyah, but recovered strongly in Marrakesh to move up to fourth place in the teams’ standings after sealing its first double podium of the season. The result has boosted the Audi-powered Virgin squad heading into the third round of the season in Santiago later this month, with managing director Sylvain Filippi praising the gains made by his team. “The Marrakesh E-Prix was not only a huge boost for the team but also a key turning point,” Filippi said. “Despite being an independent team with limited testing, we were able to unlock our true pace. “For sure, the competition in Formula E is super competitive and you never quite know who is going to come out on top, but I know there is more to come, and our double podium shows the team’s potential. Robin Frijns was narrowly pipped to victory in Marrakesh by Mahindra’s Jerome d’Ambrosio and took his best result to date in FE with second place, ahead of teammate Sam Bird, who had started the race on pole. “To get my best ever Formula E result in only my second ever race for Envision Virgin Racing is a fantastic feeling,” Frijns explained. Bird added: “After the last result in Marrakesh, we’re really looking forward to racing in Santiago. When is Formula E’s Santiago E-Prix and how can I watch it? When is Formula E’s Rome E-Prix and how can I watch it?